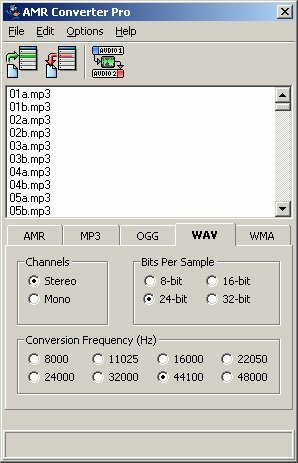 Powerful, fast, and easy to use audio conversion for AMR, MP3, WAV, WMA, OGG, and many more audio formats. AMR Converter Pro makes conversions for cell phone audio files a quick and easy task. Settings are provided for bitrate, frequency, channels, and more. Convert from WAV, MP3, WMA, OGG, MP2, AAC, AC3, AMR, 3GP, AIFF, AU, VOX, RAW, GSM, ADPCM, A-LAW, u-LAW, DSP, g726, g721, g723, MPC, MP+, etc. to AMR, MP3, WMA, WAV, or OGG with ease. AMR Converter Pro can also be used to change the compression for supported formats. The comprehensive range of supported formats makes the software very flexible, and provides a complete solution for conversion of most any audio file desired. Conversions are performed directly from format to format, which increases conversion speed and eliminates potential quality loss. The ability to automatically transfer audio tags from the source format to conversion output is also present.